If Booster Gold stole four super powers and then stole four more, how many super powers has he taken in all? Last Friday marked the release of the latest installment of the Silver and Gold Podcast. Episode 29, "Fresh Start," features Booster Gold Volume 1 #16. I love that issue. It's got a great cover, and Booster wears a crew cut, a white suits with rolled up sleeves, and a pair of red Chuck Taylors. What can I say? I'm a child of the 80s. 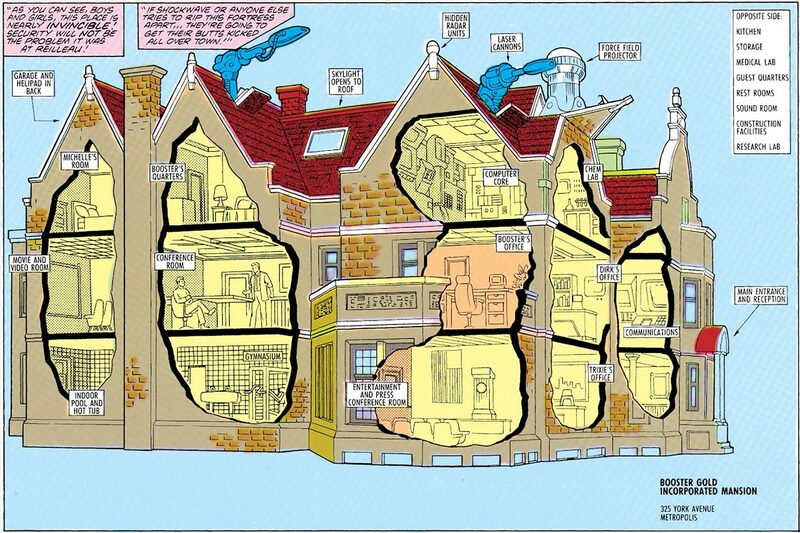 The true highlight of that issue, however, is this Silver Age throwback: a map of Booster Gold Incorporated Mansion headquarters. 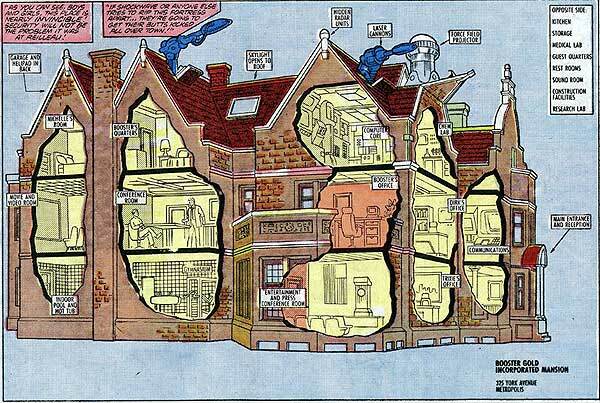 When was the last time you saw a comic with a map of the team headquarters? Kids these days don't know what they're missing. Anyway, you can find links to listen to the Silver and Gold podcast in your choice of formats at sngpod.wordpress.com. Kinda a shame that headquarters was turned against Booster during the Manhunter crisis. Still, it was a very cool headquarters. If you had five Booster Gold autographs and Booster gave you ten more, how many autographs do you have? If a villain held nine hostages and Booster Gold freed seven of them, how many hostages remain? Things have been changing in America lately, and not necessarily for the better. Not so many years ago, many DC Comics super hero bloggers and I participated in semi-regular crossover events. Now very few of us are still posting. Both FirestormFan.com and AquamanShrine.net have stopped blogging to focus their efforts on podcasting (fireandwaterpodcast.com). The Martian Manhunter blog, The Idol-Head of Diabolu, has likewise gone silent as its creator also seems to be concentrating on podcasts for his other blogs (DC Bloodlines and Wonder Woman: Diana Prince). So too, Splitting Atoms is now more podcast than blog. Others that have fallen completely silent (like Tower of Fate and Being Carter Hall). Some stalwarts soldier on, including SpeedForce.org and Kord Industres. We seem to be the exception rather than the rule. Once again, this has made me return to a question I've asked myself from time to time since Booster Gold disappeared from the pages of DC Comics: Has the time for websites dedicated to super hero blogging passed us by? Would comics fans rather listen to a podcast than read a website? Is the problem the characters or the bloggers or just shifting demographics? Don't worry, this post isn't a lead up to the retirement of Boosterrific.com. I'm only committing my rambling grumpy old man thoughts to electronic paper. I'm not going anywhere anytime soon. It's just that I'm starting to feel kind of lonely out here all by myself. I sure would like some new Booster Gold comics to keep me company. Glad you are not going anywhere. I have no interest in Podcasts either. No idea on DCs thinking with their continued lack of Booster comics. Reader since issue #1 wondering about his origin, his fight against the 1000, his beef vs superman. And the WORST Was the stupid Millennium crossover, that made Dirk the bad guys? WTF? That was a HORRIBLE Choice. Not Dan Jurgen's finest moment. nooooo!!!! Don't go anywhere. I love reading the website. Podcasts are a nice addition, but not a replacement for great websites documenting the world's greatest hero. I might be a millennial, but I started using computers in the early days of the Internet (at least, I think they were the early days, circa 1990 or so). I don't think I've listened to a single podcast in all that time (unless Youtube vids count). I am, first and foremost, a reader...I like to read and reading's a lot faster than listening. So, all of that to say: Thank you for NOT following the trend and for keeping this site nice and simple...just the way we love it. Sorry Walter! We didn't mean to abandon you! For me, it's a combination of things. The blog became a bit of a grind for me. It began to feel like work. 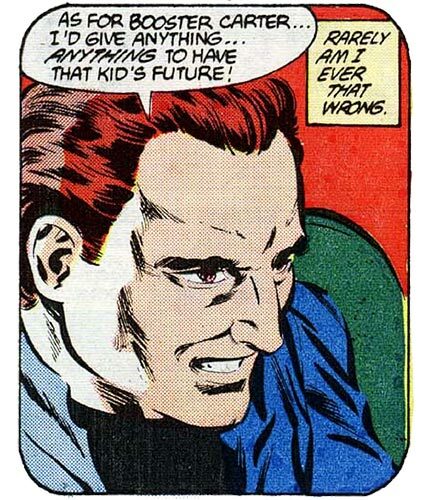 And like you, I was struggling with the way DC mis-handled (or didn't bother to handle) the character of Firestorm. And I have a rule about hobbies, if I'm not enjoying it, then don't due it. I've been meaning to do a final "wrapping-up" post over on the blog. The other reason is that I'm having a blast doing podcasts. So much more fun to talk about a comic with my friends than write about one. Just my two cents. Hope you are doing well! You are still doing an amazing job over here, and I regularly plug your site on my JLI Podcast! Shag, I'm 100% behind only doing things you enjoy. And thanks for the plugs! If Booster Gold had two dollars and earned seven more, how many dollars does he have in all? If a villain held nine hostages and Booster Gold freed three of them, how many hostages remain? The Silver and Gold podcast is still going strong. Last week, for 10/10, they covered Booster Gold issues #9 and #10. As an added bonus this time around, the Silver and Gold hosts are joined by longtime Booster booster Herbert Fung, who has shared many of his own sketch commissions with Booster Gold fans here at Boosterrific. Hi, Herbert! You can find a link to the podcast at sngpod.wordpress.com. If you owned three Booster Gold comics and then bought seven more, how many total comics do you have? The Silver and Gold Podcast has a new home: sngpodcast.wordpress.com. It's there you will find the latest episode discussing Booster Gold Volume 1, #8. It's important that you don't confuse this new location with sngpodcast.tumblr.com, home of the Sawdust and Gin Podcast, or twitter.com/sngpodcast, which is devoted to the Silver and Gold podcast for discussing NFL football franchises of Oakland and San Francisco. Those would be the sorts of embarrassing mistakes that only a novice time traveler would make. If Booster Gold stole two super powers and then stole four more, how many super powers has he taken in all?